The word reflection comes from Latin and literally means ‘bending back.’ Originally, reflection meant a sending back of light from a reflective surface (as in a reflective mirror or a reflective pond). With time, however, it’s usage extended beyond the physical to imply fixing one’s thoughts in a particular direction. If something is absent, I can bring it back to my mind’s eye through reflection. The mind’s ability to reflect is both a blessing and a curse. It is a curse when we permit it to indiscriminately replay past events or indulge in future fantasies. It is a blessing when we use its reflective powers to maintain our focus on a conscious aim. Our mind’s ability to reflect gives it regenerative power. By reflecting on consciousness, our thoughts move towards consciousness; thought can be used to transcend thought. This makes the mind a valuable tool in awakening. In May, we explored the mysterious appearance of self-consciousness. We shared simple shocks that awoke us from sleep during our day and noted how they all brought with them the light of ‘self-observation‘. In June, we explored how to prolong self-consciousness. By using the light of self-observation to divide between what kept us asleep and what helped us stay awake, we prevented ourselves from returning asleep. We called this second step ‘separation’. We superimposed these two steps onto the Biblical creation myth. ‘Self-observation’ was the creation of light. ‘Separation’ was the division of light from darkness, of waters from earth, and the creation of dry land. At this stage, we experience ourselves as two: our chaotic thoughts, feelings and sensations on the one hand, and a conscious observer on the other. This separation is still vulnerable and can at any moment fall back into chaos. To secure this separation, we must use our mind’s ability to reflect. 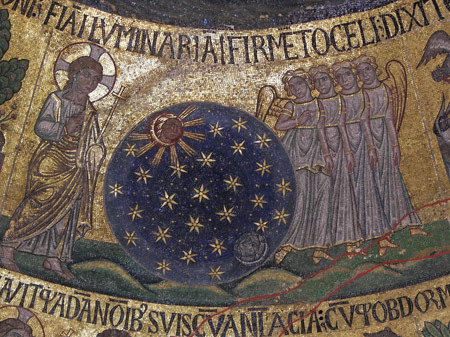 According to the Bible, the sun, moon and stars do not emit their own light. They are reflective agents of the light of God. They emulate the initial ‘let there be light’ that sparked creation. After God divides the light from the darkness, He appoints the sun, moon and stars to maintain this division. By reflecting His light, they mirror His creation. While the light of consciousness appears–and disappears– mysteriously, the mind can foster its return. We can form thinking patterns and attitudes that support self-consciousness. These become our internal lights; the rulers of awakening and sleep that help us keep our internal opposition in check and maintain our aim to be. In this spirit, my question to my writers is: which thoughts and attitudes help you regenerate self-remembering?